As I looked through my meager collection of postcards, I wondered if I'd find one with a sign that also included a family story. I mean, really, what are the odds? At first, I didn't find any, but then I remembered that I had a few more. 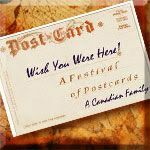 They weren't with the rest of my postcards because they're a part of the "Genealogical Jackpot." I quickly located them, and I found that one, indeed, had a sign. Albeit, a minuscule one, but a sign nonetheless. As I read the back of the postcard, I realized that the whole postcard was a sign. You see, the postcard is one that was sent by Annie Ritter to Harvey "Harve" Pointer [the beautiful Pearl's husband]. I had done some preliminary research on Annie, but I'd lost her trail. Anna Elizabeth Pointer was born to Daniel & Emeline (Belcher) Pointer Jul 1869. She was more than likely named after her Aunt Anna Pointer who married Alfred McHone. Annie married Charles Padelford/Paddleford 25 Apr 1885 in Story County, Iowa. She gave birth to 2 children with only one surviving by the 1900 Census. The surviving child was Maud born abt 1887. In addition, according to another researcher, she married a second man by the last name Ritter. However, this information was not sourced. So, what had happened to Annie? Well, I hadn't known until now. This little postcard, or sign, was a very nice clue. The front of the postcard is a picture of the C.M. 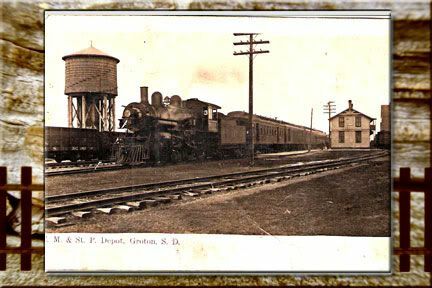 & St. P. Depot, in Groton, South Dakota. Hard to see with the naked eye, is a sign that reads "Groton" on the Depot. On the back, she writes to her brother, "Harvie Pointer." She indicates that she's going to Canada in 3 weeks [postcard dated by Annie 30 Aug 1913]. She also says she'd like to see him again one more time, but that she doesn't have the money to do so. She signs the postcard "loving sister Anna Ritter." Aahh. So many clues in such a small space kept by my husband's great-grandfather, Harvey Lewis "Harve" Pointer. This postcard from Annie to Harvey confirms that she probably married a man by the name "Ritter" because she signs her last name with "Ritter." Since she's in Groton, South Dakota, I can now look there and the surrounding area for marriage records. Annie and Harvey had a brother and uncle named George Washington Pointer. The uncle and his wife moved to Dahinda, Saskatchewan, Canada, and had 6 children there. [They had 8 in total but the 1st two children that were born in Iowa perished there.] Had Annie and her husband moved to live near her Uncle George? I will be searching border crossing records for Annie and her husband. Also, where was her daughter, Maude? By 1913, Maude would've been about 26 years old. Where did she end up? Did she marry? I located a map of this particular railway's line. If she took a direct route from Iowa to South Dakota, then I have everywhere she may have stopped and possibly left records along the way. This is all I can think of right now, but I'm sure there is more that will be apparent later. As is usual with genealogical clues, it answers some questions and raises more. 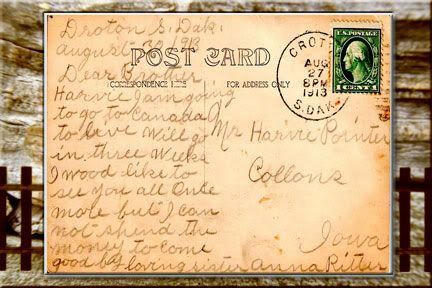 I'm sure thankful, though, that Annie wrote her brother Harvey a "goodbye" note on a postcard and sent it to him. Likewise, I'm thankful that it meant so much to Harvey that he kept it and that his descendants kept it, as well. Something so simple as a postcard of a train depot in South Dakota has given me more signs of Annie's story. 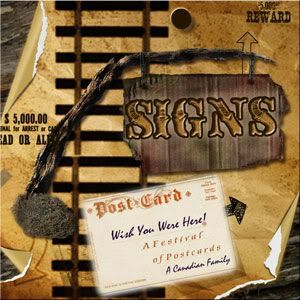 Festival of Postcards, 3rd Edition - "Signs"
I wish more of my ancestors were pack-rats. What a great clue for you to track down all this information. I think it's great what you're doing with the legacy you've unearthed of your ancestors... one that you are furthering by piecing together the puzzle. As a Video Biographer, I've met some family members who find trunks or closets full of pictures - undated and unnamed - and that's how those people go down in history. Not your family though! I was struck by how sad it was that she wanted to she her brother "one more time," but didn't have the money. How we take for granted our mobility. Can't wait to see what you do with those clues. What a wonderful discovery to be able to peice so much of the family history from only a few short lines. How sad that those few lines and image are with the reference of seeing each other one last time. But thankfully she did send the message and leave a trail for you. I like what you did with this postcard and the story it had to tell. FYI, I have Paddlefords in the extended branches of my tree -- the oldest being Davis Abijah Paddleford, born 1846 in Wisconsin, and wound up in Coleman County, Texas. Thanks for sharing. V.
Great detective work! and it prompts me to document a good deal more of my family's history. What I especially loved about your post - and to many of us have done this - is that you described your new lines of pursuit. I always love to get a look at other people's research processes. What great postcards! 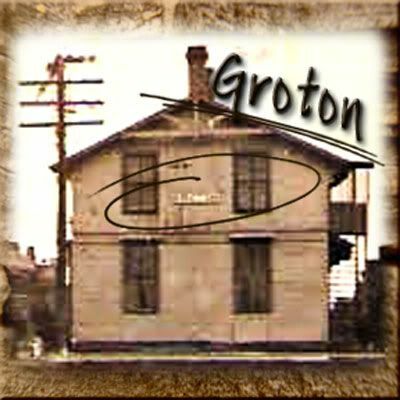 When I saw Groton, I at first thought it was Groton, Massachusetts.